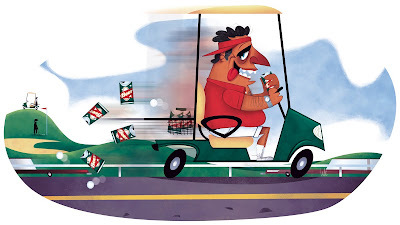 A South Milwaukee man allegedly drunk, steals golf cart to drive home. Police say 47-year-old James Polakowski had beer and his clubs in the cart and he told the officers he'd had about ten beers. He told police he'd been golfing with relatives who left him behind, so he decided to drive the golf cart home. gostei muito das duas ilustraçoes. I'm glad you posted some new work, Thierry-it's been too long! These are both fantastic. I love the way you handled the background shapes in this one. Also, thanks so much for featuring me as blog of the week. I am very humbled and flattered. It's a real honor,especially coming from someone as talented as you! merci beaucoup! Très bon :P… cette tête me rappelle quelqu'un mais je n'arrive pas à y mettre un nom.